The anticipation of Christmas morning is enough to wear anybody out. From the child excitedly revealing their heart’s desire while sitting on Santa’s lap, to the frazzled parent frantically trying to make good on the fat man’s promises. As much as people try to tell you it’s not about the presents, it totally is. This was especially true for children of the 80’s who were being bombarded daily with cartoons telling them what toys they had to own if they were ever going to make friends with the cool kids at recess. Yep, that’s me up there smiling with Santa, having just told him how badly I needed some Popples or at the very least a Storm Shadow G.I. Joe figure (yeah, I was all over the place). And you know what? Santa didn’t disappoint. In fact I have the photographic evidence to prove it. What follows is an examination of personal vintage photos from the Christmas mornings of my youth. Within these frozen moments in time you’ll get a glimpse of precious playthings that you yourself may have unwrapped in days gone by. This photo here pretty much encapsulates the pure joy of giving and receiving on Christmas. There I am decked out in my Superman pajamas, staring longingly at my new toy and there’s my Dad right beside me with a satisfied smile on his face, knowing he just made a 3 year old’s dream come true. So what was this toy I just had to have? Why, it’s the Voltron Vehicle Team Battle Riser, of course. At least, that’s what I can make out on the box. But here’s the thing, I don’t remember ever requesting this toy or seeing the show that inspired it. I’m not saying I never saw Voltron, because that would be silly and how dare you even think such a thing. But the Voltron I knew was made of mechanical lions, not cars and helicopters! Apparently the Voltron famous in the U.S. was Lion Force, but after running out of those original Japanese episodes they tried to keep the excitement alive by adapting another anime into Vehicle Force, which met with diminishing returns. Now you may say, maybe that is the Lion Force version in your tiny hands, you can’t even see the front of the box in the picture. True, but look at what my Dad is holding in his hands, that is clearly not a bright blue mechanical lion, but the metallic blue of the Vehicle Force leg. Add to all this the fact that the Battle Riser figures didn’t break apart into separate vehicles, but were one solid piece and it’s a mystery for the ages. All I can figure is that I was very spoiled that year and got 2 Voltron figures, neither of which was the Lion Force version. The closest I got to the traditional Voltron was buying the broken torso at a garage sale 7 or 8 years later and hot glue-gunning spare Transformers parts to make a Frankenstein monster. Whatever the real story is, the truth is written all over my face in awestruck wonder. Enough of that nonsense, here’s a Christmas prize on display with no questions asked, it’s Inspector Gadget! I was big fan of this show, especially his niece, Penny’s computer book and video wristwatch communicator. That uber-70’s looking guy I’m sitting on is my “Uncle Jay” (not actually related), I can smell the Aqua Velva now. But back to the toy, this thing was played with regularly and came apart piece by piece until all that was left was the head with a telescoping neck. I mean it had “20 Moving Parts” and “8 Magic Action Features”, what kid could keep track of that many pieces? They were fun while they lasted though. With this figure, you could actually re-create the opening sequence to the cartoon. You had the extending Go-Go-Gadget Legs, the mechanical arm with smashing mallet or umbrella, the helicopter head-piece and the coup de gras, spring loaded firing fists! Star Wars collectors know how Kenner put the kibosh on Boba Fett's firing missile backpack due to safety concerns, well Galoob could have cared less and I love them for it! I still have two graphics I cut out from the front of the box that reside in the album sleeve next to this photo for safe keeping. Oh, Gadget thanks for the memories. Now on to the finale for a picture that’s so crammed full of 80’s Christmas toy goodness, I’m going to advise you grab a bib to catch the drool. It appears to be late Christmas morning in this photo, all the presents have been opened and astride my inflatable car I am ready to ride into the New Year with my Christmas haul in tow. Obviously I was proud of my He-Man Bop Bag. I wonder how many times I punched out “the most powerful man in the universe” during my childhood. By all accounts I was more successful than Skeletor ever was at getting the upper-hand on Eternia’s favorite son. Speaking of Masters of the Universe, check out the empty action figure packages on that classy golden arm chair. You can clearly see the front of one card that I can just make out to say “Battle Armor He-Man”. I usually had more fun with the side characters than He-Man himself, but the dented armor that showed up each time his chest was attacked made for a cool action feature. I’d have to guess on the second one, since only the back of the card is showing, but my money is on Spikor. I loved the texture of the rubber spikes that gave the purple one his name and played with him the most of any of the Masters of the Universe toys I owned. What may not jump out at you is the fact that I’m actually wearing Transformers PJs in this year’s photo. It’s hard to decipher if it’s an Autobot or Decepticon emblazoned across my chest, but from the basic shape I would say it has to be Ultra-Magnus. In keeping with my fashion sense, if you look back at the “Goody Chair” you’ll see an opened Transformers package that was most likely Bumblebee. 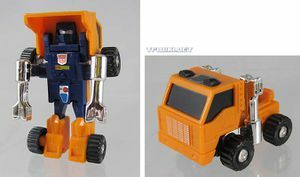 The classic G1 Transformers came in boxes, and were pretty expensive, later on in the line they produced smaller figures that could be had for a couple dollars by the more frugal parents and less discerning kids. I think I got the Transformers Big Wheel this year too, so I probably wasn’t whining about the size of my alien robot figures. Well that’s all for this installment of Holi-Dazed: 80s Toys Unwrapped. So let’s hear about some of your Christmas morning victories. What was your biggest score? What do you wish you still had? If there was one I would apply. Sweet Snoopy shirt by the way in the Santa pic. @NLogan Seriously, amazing photo analysis skills. Do you work for a secret retro-toy wing of the FBI? If you can't tell I love looking at your old photos of toys recently opened. I wish I had more of my own. Spikor is one of my favorites too. 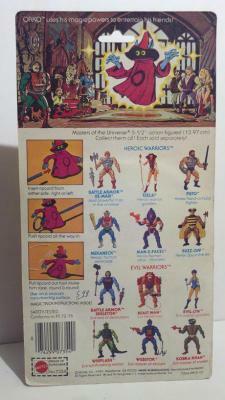 But the card back for the 2nd Masters of the Universe is for Orko. 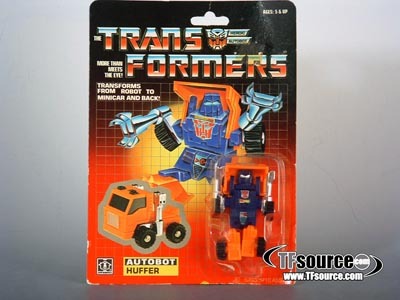 The Transformer is the Autobot Huffer. The packaging matches and you can see the toy underneath Mr. T. on the chair the orange Semi Truck Rig. Your Transformer pajamas are of Thundercracker a Decepticon jet. 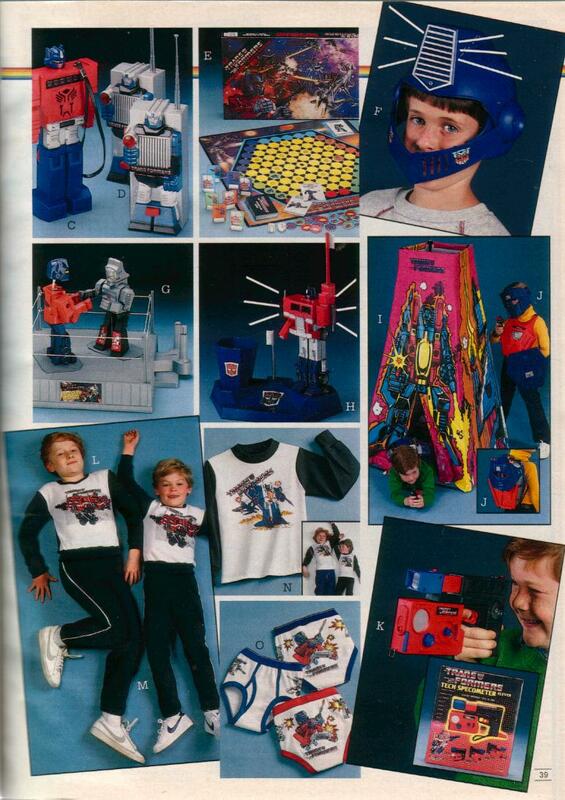 Item N from this catalog page. Hoju the box you are holding is definitely the Voltron Lion Force Battle Riser. The images on the side of the box match perfectly. I believe your dad is holding a blue lion miniature possibly looking at the belly. I think the four silver bumps correspond to the four rounded parts at the top of the legs and the white head is actually the muzzle seen from straight on. The vehicle force has prominent yellow or red on the blue legs and black tank tracks underneath. I also had Mr. T from the A-Team in two sizes yours and the 3 3/4 inch GI JOE size from Galoob. 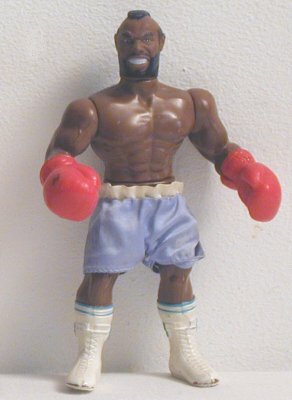 In addition I also had Mr. T as Clubber Lang along with Rocky and Apollo Creed. Some great memories! Thanks for sharing. Yeah, pull out those photos! I've seen that last picture for years and never noticed the Mr. T figure hiding in there. Who knows what you'll find. This is sweet, Hoju. A look into those priceless moments on Christmas morning that we all love so fondly. I myself have some photos of the moments following my opening of the Shogun Godzilla, Monchichis, Stompers, and much more. It makes me want to dig them all out and look them over again... just to see if I can spot any long forgotten gifts I received in my youth.